A storm apporaches and Kagome is late getting home. When the storm hits the city, she finds herself thrown into the secrets and darkness of the night. She discovers life changing issues that are hidden within her own life that links her to the war that is taking place in the shadows. She starts on a journey that she never thought would be possible even in her dreams. Kagome's looking up at the sky, thinking about wishes. I also don’t own the lyrics used in this drabble. They are owned by Disney and Jiminy Cricket. The other song is owned and performed by LeAnn Rimes. Written for the 'Star' prompt for IYFF Drabble Community at LJ. Word limit was 450 words. First Place tie. Disclaimer: I do not own InuYasha, Rumko Takahashi does. InuYasha sees the women he love return to her time. What faces him in the next four weeks of a living hell? How does his close companions and older brother help, and what does he find in himself that is truly more powerful then Inuhidoi ever was? In the next month, will he be able to face Kagome, the only women that went through hell and still love him, again? Kagome gonna see her best friend, InuYasha, again after 2 1/2 years of traveling for her work. Will they continue their friendship or will something else appear. I don't own the songs used on here. I Put a Spell on You is from Disney's Hocus Pocus, as well as the characters mentioned. This I Promise You is by N'SYNC. InuYasha remembering the day he met Kagome. Written for the 'Nostalgia' prompt at IYFF Drabbles community on LJ. Word limit was 300 words. FIRST PLACE! The coffee was hot. Steaming hot as I poured it into his cup. It warmed my hands through the pristine white china. I set it down on his tray, smelling it and closing my eyes. His lips would touch the crisp edge of this cup. The coffee would pour into his mouth and warm it. He would bite into the scone that I have prepared for him with love, care, and extra everything. I set this one aside from the rest. He has been coming to my little café every Saturday and Sunday since it opened. He sits in the same place, drinks the same coffee, eats the same scones. He is my beautiful constant, and one day, I will build up the courage I need to go over there and talk to him and stop loving him from afar. Summary: Kagome, 18 years old, has an accident at school rendering her blind. What will InuYasha do when he finds out. Stay by her side or throw her to the curb. 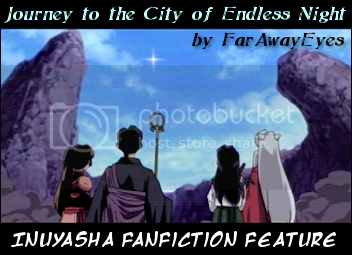 Summary: Inuyasha finally finds a way to admit his feelings, even if it is a tad too late. Songfic written to 'Anyway' by Wheatus. Is it even possible to fall for someone when first bumping into them? Could there even be a possibility of them meeting again? And even so, could it even last long to delevolp into something before someone brings it to a screeching halt? Trust and love will be put to the test while someones heart is broken. Summary: Kagome is an orphaned hanyo with spiritual powers. It seems that a sword called Kenmi was her parent's murderer's goal. Who's the murderer and will Kagome and the rest of the group defeat him? Summary: What happens when Kagome finds out that her family are more than just simple shrine keepers? When her cousin comes to visit and Kagome learns that not everyone is human, how will she deal? Can they find and conquer Naraku before he drastically alters the future, or will modern Japan become feudal Japan? Hell has been opened, and 43 of the most fearsome demons who have ever lived escape...Naraku among them. After three years apart, Inuyasha and Kagome reunite to face this ultimate challenge of strength, willpower, determination...and love. Takes place after Naraku is defeated in the manga. I didn't care for the events that happened after that point. This story is an alternate ending. Disclaimer: I do not own InuYasha, Rumiko Takahashi does. InuYasha, Kagome, Miroku, and Sango are on the hunt for Naraku when a very old curse that is passed down through the Inu family, attacks InuYasha. Now Kagome, Miroku, Sango, Kouga, and Sesshomaru must team up to fight a enemy that was even more powerful then Inu no Taishou himself, in order to save InuYasha's soul. Summary: Kagome shares a steamy bath with her loving husband, and realizes how lucky she has been in her life. WAFF and Post-Canon Romance. Work-In-Progress. When Inuyasha, Kagome, Sesshomaru and Rin find themselves in an odd valley can they find a way to work together? What does Naraku have to do with it? Just who have they found themselves amongst? Can they get back home?